Bookcases are probably my favourite custom joinery to design. Whether they are used to conceal or to display, they usually get the rock star location in the house regardless. And even better if they get filled with lots of lovely books! I have been lucky to get to design some fabulous bookcases recently. To see them become reality is a thrilling experience and why I want to be an interior designer! Here’s a little preview to see some of them. The most common material for any joinery nowadays is melamine. It’s economical, practical and easy to work with. But it’s very white and may look very plain just by itself. I like mixing melamine with timber details to give it some contrast, definition and warmth. This bookcase was a DIY job, using IKEA bookcases as a basis, with a new kickboard, bulkhead and trims. It turned out to be quite fiddly but suits the room very well. Laminate or veneer have basically the same idea: it’s means the core substrate (chipboard, melamine, plywood) is covered with another material. In case of a laminate it can be any of thousands of colours or textures. In case of a veneer, it’s thin slices of real timber. Both come usually as boards of different thicknesses and their edges need to be finished with a suitable material. The veneer boards are sturdy and can often be used for a longer spans than timber in equal thickness. It costs much less than solid timber. Veneer is usually finished with a clear coat of polyurethane to make it more durable towards stains and watermarks. 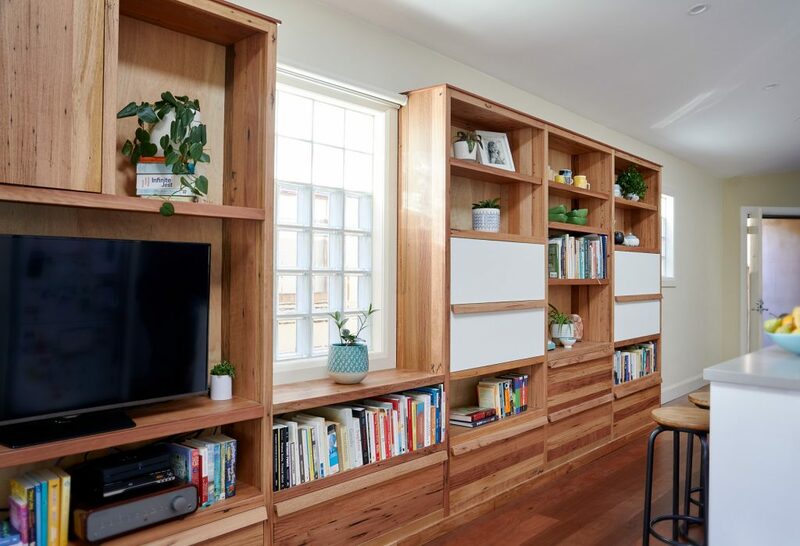 This blackbutt veneer bookcase has thin strips of timber instead of edging at the front of the shelves to make them appear chunkier. Its location had a little – ehm, challenge – but I love how the bookcase frames the fishpond window now! Plywood is layers of wood glued together. It is sturdy, fairly economical and easy to work with. It tolerates humidity and I absolutely love the edge pattern! You can stain it to match any timber colour – or buy plywood pressed of the timber species you wanted to use in the first place. It is very durable and paintable, and a great option for back panels. Solid timber is unbeatable in the feeling of warmth it creates for a room. It’s a natural material and you don’t need to use any chemicals to finish it off – just a little bit of oil is enough. Unfortunately it can end up being very expensive and – especially if using Australian hardwoods – very heavy. Most joiners only want to work with fresh timber, since preparing reclaimed timber for re-use is very time consuming. 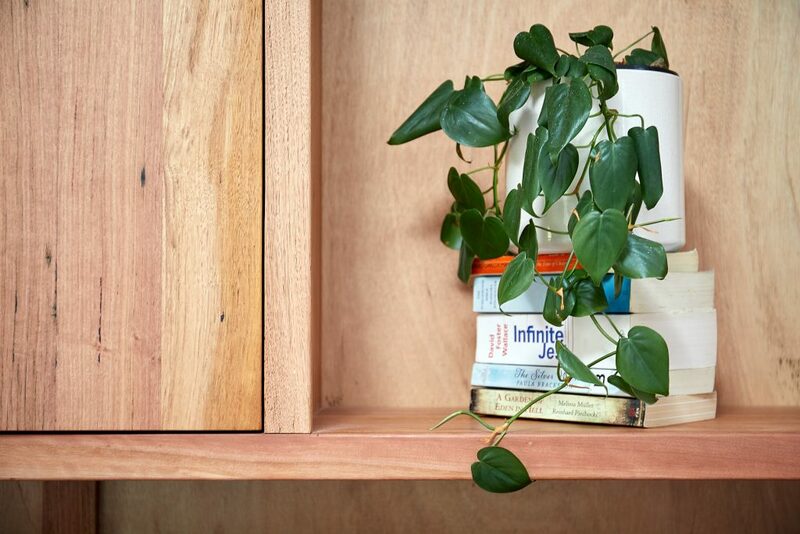 If, however you have spare reclaimed timber lying around, it can be used to make a fantastic bookcase. This one here used to be the framing of an old kitchen that got demolished. The joiner had to remove hundreds of old rusty nails but it was worth the effort! This one used to be a chicken coop. Look at the beautiful grain of the reclaimed timber! 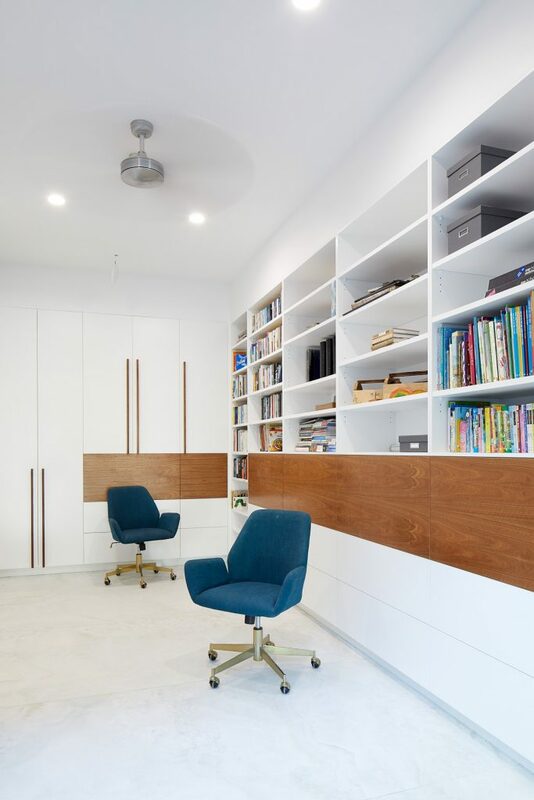 Purpose – Function drives the form: what will the bookcase be used for? Is it to display books, toys or TV? Or is it to hide books, toys or TV? Which room will it be in? Are there any limitations, such as windows, ducting, plumbing? How big bookcase is required? Style – What is the style of the house or the room? 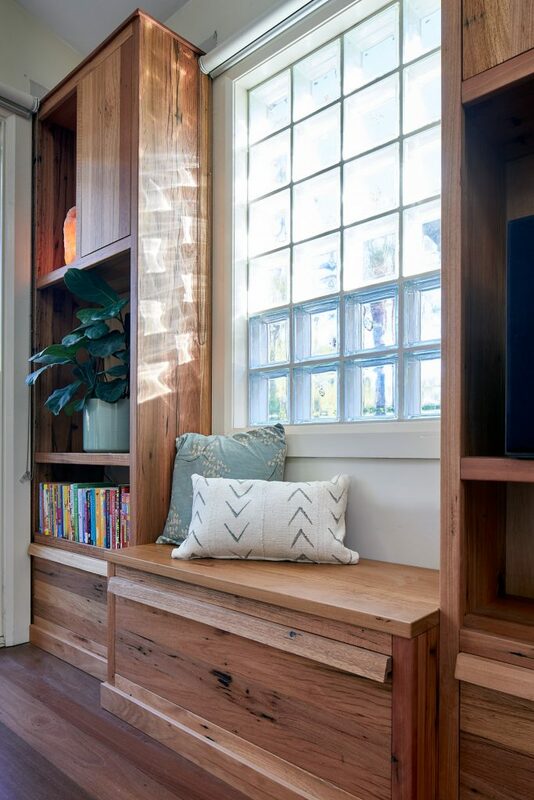 A rustic room requires chunky shelves, modern airy room requires thin lines. A Victorian room would require elaborate details whereas a Scandinavian room benefits of very minimalist details. Materials – That depends on the budget and style requirements. Some materials might automatically filter themselves out due to budget limitations. The material must compliment the design and style. Details – Making sure all drawers and doors open and function as intended, defining the handles and drawing all the little details. And then a lot of nervous waiting follows while the bookcase is being made. This is why I love it! The feeling, when after a long wait the design turns to reality is fantastic. 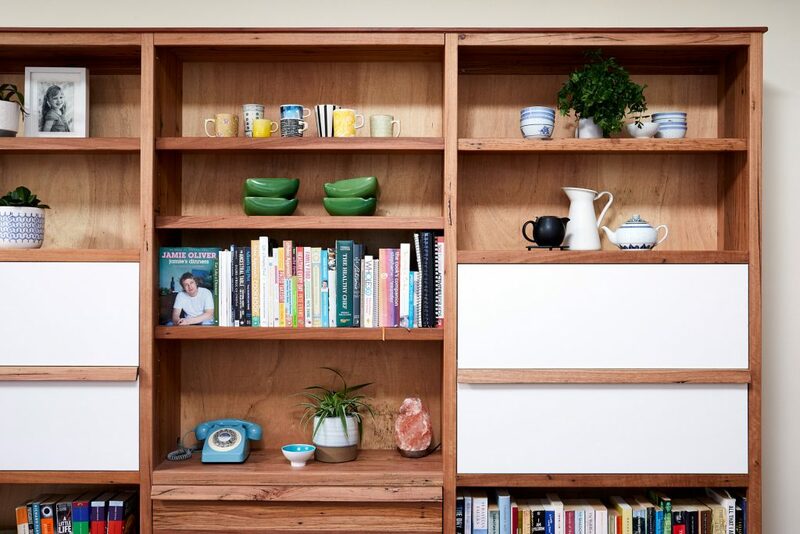 I love the moment when you can see the bookcase take shape and it looks exactly like I designed it, except a million times better – because it’s real! Contact me if your books would need a new home!